Hard not to miss these signs, right? After what has been a fulfilling summer where I was able to find some moments to unwind, just like you (probably), I am returning from summer plugged into my device way more than I want to be — focusing on the news, my calendar, work, and preparing for the general whirlwind that is September. Thankfully, though, I got a wake-up call over the weekend that reminded me just how important it is to pay attention. And I don't mean to your phone. I'm talking about your surroundings. My husband, Marc, grew up spending his summers in Niantic, Connecticut (20 minutes from Mystic, for all you Mystic Pizza lovers). Every time I coached over Skype from the cottage this summer, it came up that I was not in my usual Brooklyn office, but instead I was in Niantic. Much to my surprise, three clients in one week had not only heard of this small shoreline town, but had actually travelled there for the sole purpose of visiting the same main attraction that I had heard of but never thought twice about. 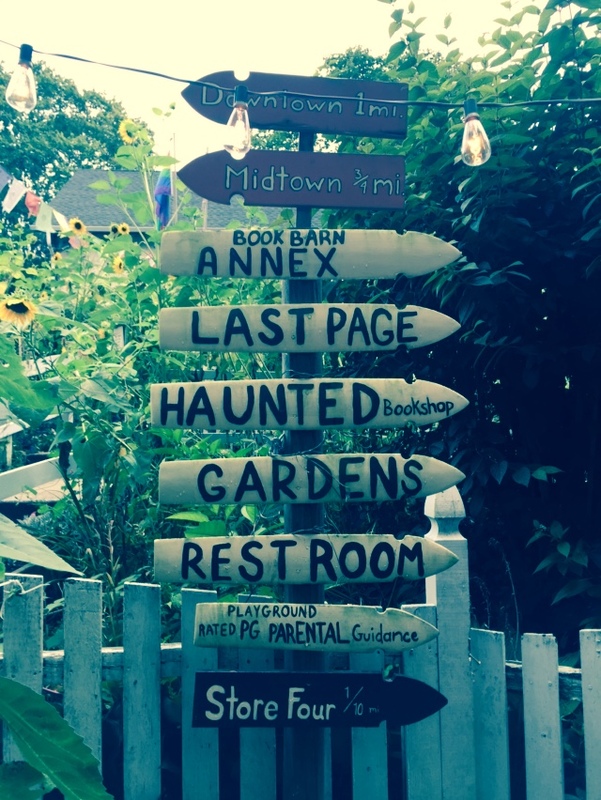 Oh, and it happens to be a 3-minute drive from our house: The Book Barn. It’s like the Niantic Starbucks for Used Books — there are four locations all within a half-mile. I always said I'll check it out sometime. Maybe on my next visit. Or the next year. Truth was, I already had a favorite bookstore in another town nearby, so it never seemed important to check this one out. But you know that moment when enough people you trust mention the same place or book or tv show, and you are like, “Okay….now I’m tuning in?” That happened to me on Friday. On a quick break in between coaching sessions, our friend Dave and his girlfriend Elizabeth had stopped by the house to say hi, and in the two minutes I saw them, they shared how they were in town on their way home from Cape Cod, specifically to check out…you guessed it...The Book Barn. Okay universe, I GET IT. It’s time to get my booty to The Book Barn. Perfect rainy day activity. Off I go the next day with my family. Lo and behold, this place is out of this world! It was like I walked into some crazy mix of my childhood library and my beloved summer camp: old, weathered, full of endless nooks and crannies, with chairs and couches to plop into and even a goat chillin' in the yard. I was transported back to a time where technology was not yet a thing on my mind, and certainly not yet a source of addiction. I was in heaven. Each book in this place is like the Velveteen Rabbit — worn, used and loved. I saw books I grew up with, Zoe picked up books I remember my parents reading to me when I was her age. I instantly melted, remembering the thrill of learning to read for the first time. Zoe was so into her book she wouldn't look up for the picture. But what really makes this place special? The people inhabiting it. The preschool teacher I met in the kids room who spends every Sunday looking for new books for her classroom while enjoying her morning coffee. The librarian in line speaking to the cashier about what books she is dropping off next week. And the kids running around with the excitement of building a fort of blankets and reading underneath it with a flashlight. Can you picture it yet? This was perfection to me. I was with my family, no where else to be, exploring all the little gems of this hidden treasure we had discovered together. Even Marc (who was doing me a favor and figured we’d be in and out in 10 minutes) got lost in the cookbook section that seemed to go on for miles. There was no rushing. We were all browsing. Taking our time. Sure, I’ll say that again for all the New Yorkers who need to hear it (including me)...TAKING OUR TIME. This simple place that we must have driven past hundreds of times rocked my world. Every summer that I’ve come to Niantic, I’ve been busy focusing on family time, going to the beach, doing the routine things or, honestly, reading something on my phone in the passenger seat, not fully paying attention to my surroundings...missing what was right in front of me. Is the moral of this story, "Get thee to a used bookstore?" Well, yes. Please get out there and let’s all support our local bookstores, am I right?!? But that’s not the whole point. It happened to be about used books for me. But for you it might be a hike on a trail, or going to a new restaurant, or taking a new class, or listening to a song you have never heard before, or seeing a show you know nothing about, or venturing to a neighborhood you never thought was worth checking out. The point is to look up. Look up from your phone long enough to see where you are. And then put your phone down and take the time to explore the mysteries around the corner. Like me, you might just wander into your new happy place that will soon become your new routine. See ya in a few weeks, Book Barn!